Identifying problems: Games played on either a KS1 or KS2 Magic Square can form a bridge between a child and assessment and identification of hidden learning difficulties which may have been overlooked in the classroom setting. 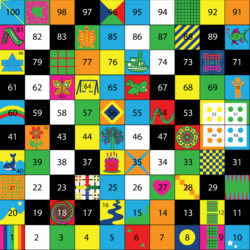 1 to 1 learning: The Magic Square is designed to be as inclusive as possible with feedback from S.E.N. teachers being used to constantly improve and add squares and concepts that look into specific needs. It is possible for a disruptive or distressed child to find space on the magic square to have a calming time out moment whilst exploring their own ideas outside in a kinaesthetic way. On an educational level, it can be helpful in working through concepts which have already been understood by the majority of a class. Also, small groups of children who grasp concepts quicker than the majority can be given time on the magic square whilst the remaining class members reach the required level.